The NSCA put on their annual combat clinic at the UFC Performance Institute in Las Vegas, NV on 9/21 – 9/22. This was a collection of strength and conditioning experts talking with the UFC science and training staff about how to better work with combat athletes in improving their performance both on and off the mats. The UFC strength staff were very specific off the get-go that strength and conditioning experts are only to be supplementary towards a combat athlete’s training. The training with the combat coaches is the primary, the weight training is the secondary. And the secondary needs to be loose and flexible in design to adjust when an athlete comes in with soreness, pain, or injury. The location itself is amazing. One of the staff said “I know this place is like Disneyland for sports trainers.” A variety of treadmills, fitness bikes, squat racks, pull up bars, rock climbing holds, Vertimax, free weights, kettlebells, medicine balls, indoor and outdoor sprinting tracks, TRX equipment, sandbags, etc, etc made up the first floor with a boxing ring, octagon, rolling area inside a cage and a variety of thai bags, punching bags, and even one of those “test your punch strength” machines being on the second floor. PJ took 4 volunteers up front, with me being one of the 4 volunteers. We learned how to properly belly breathe through the nose / through the nose then out the mouth, and solely through the mouth and where each of these versions of breathing fit into the recovery process. Mouth breathing for when you’re extremely winded, in the nose and out the mouth when you’re partially winded, and nose only for your normal typical breathing. Matt taught us about punching, covering science that he’s done with Pavel and a few others. 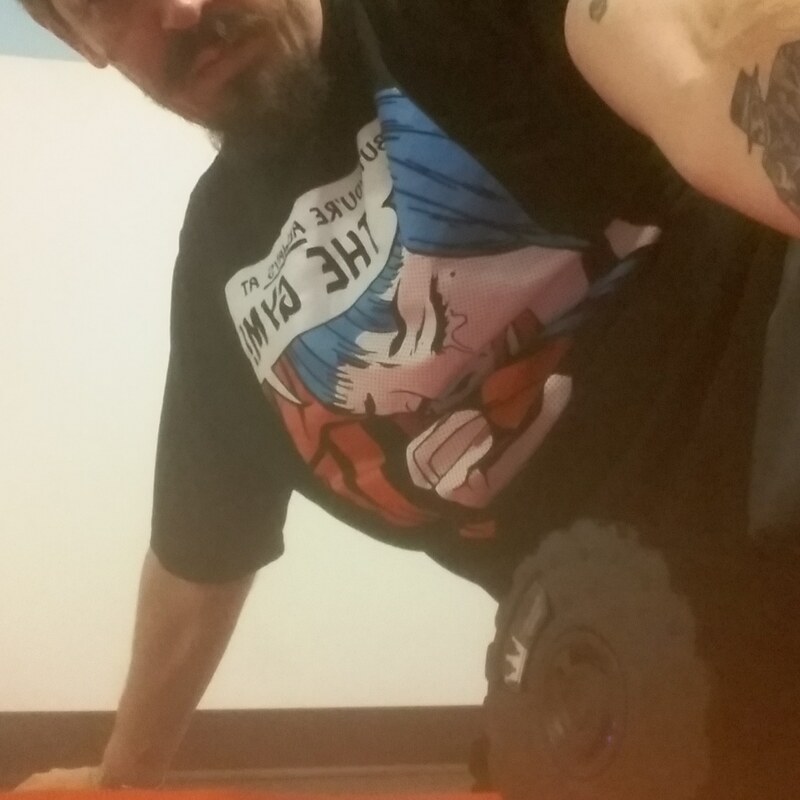 [Potential confusion correction – Matt trained at WestSide Barbell. Pavel (most likely) came in with influencing the relax / tense portion of the punch. 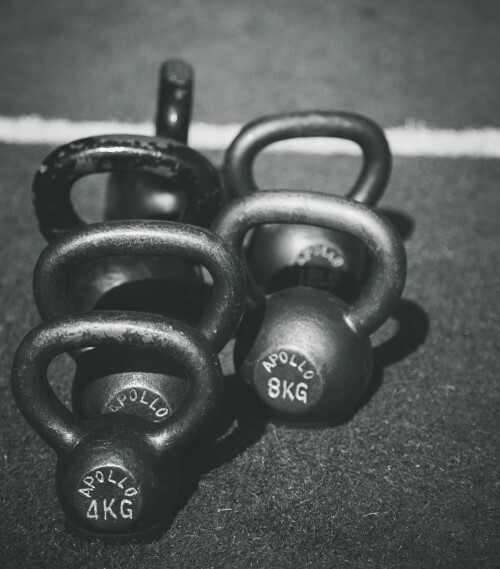 This is a common practice in the Pavel kettlebell community.] The basic takeaway was that a punch has 4 phases, an initiation, a relaxed state, a tight state (impact), and then a recoil. 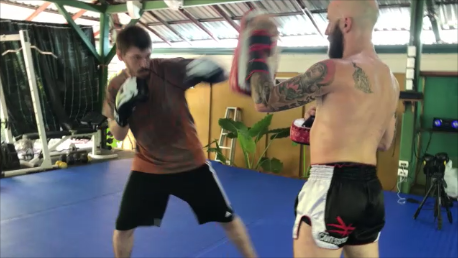 He also covered the types of training he likes for punching power, which included a medicine ball technique that can be used to train rotational punching power in fighters. I plan on training this in my own practice, as well as using this as an additional oblique exercise for my clients. Joel dispelled a myth I had learned in high school regarding breathing. Did you ever have a coach that said “Don’t lean forward to breathe, stand up straight!” when you were winded? Here’s what Joel had us do and here’s what I want you to go try. Grab a heart rate montior. I like my (read my review) Wahoo fitness monitor (or buy one here.) Go pedal on a bike. Get your heart rate up to 130. Lean back and watch your heart rate. Now lean forward. If you lean back your heart rate should stay at its current rate or potentially go up (it might go up just based on the fact you’re slightly pedaling faster.) When you lean forward your heart rate is going to decrease. Rapidly. Here’s the other piece. Get your heart rate up high. Then stop exercising and either lean forward to actively breathe (which comes from the first speaker teaching how to breathe properly), or sit down and lean forward to breathe. Do this for about a minute and check your heart rate. This was honestly the most amazing part of the entire seminar for me in terms of how to get someone to recover quicker. I can’t find my slides currently on the monitoring and profiling. I believe they covered all the cool toys they had at the Institute and how tracking and profiling their athletes can better aide the combat training community (fight trainers, strength and conditioning coaches, recovery experts, etc, etc) in using science to make better training decisions to make the best athletes they can. Mike Dolce covered some of the horror stories of weight cutting that are currently present in the mass media, then talked with us about how there needs to be more knowledge in this area so fighters aren’t relying on “well the guy who bags my groceries said I should cut weight like this” type information that puts their lives in danger. He was an incredibly passionate speaker on the subject. Heather Linden covered some interesting stats on common injuries in the community and how strength coaches may be able to work with the athletes to better improve their bodies to perform better for longer. The idea here being that with a little bit of strength training in squat training or hip hinging (or a variety of different exercises, I’m just picking 2) the athletes may move more efficiently, which can prevent injury. The interesting thing I learned while here is that the weight room IQ is generally low with boxers, thai fighters, BJJ guys, etc. I’m trying to leave the wrestling community out of this statement as many of them who wrestled in college had entire strength programs behind them to teach them proper weight room technique. A boxer or thai fighter may never have learned the proper mechanics around squatting in their life, leaving them more prone to common injuries that a desk worker could / would also suffer from. Bo’s slogan for his session was “cardio bro.” The fighter gassed out because he lacked cardio, bro. It’s not “cardio.” We went over the energy systems available to the body, how you need to be aerobic and anaerobic depending on the situation that takes place in the fight game, how you need to be powerful, strong, and fast, and how you can test for these metrics without working in a multi million dollar facility. If you go back to some of my earlier blog posts on training for a 5K I target both the aerobic and anaerobic systems with sprint and long distance running training. Working all systems is probably less useful in a 5K race (I like the anaerobic for a strong finish or for bursts of speed to pass people) but much more useful in mixed martial arts disciplines. Day two lunch – I don’t think I covered day one lunch above, so if I forgot it above it was a ham (or turkey) sandwich and a bag of chips. Typical conference food. But day two. Day two they opened the employee cafeteria to us. Think Chipotle salad or bowl. That was lunch. With about 5 people behind the counter making it for us. Tony’s speech was very interesting. They looked at a fight discipline – say BJJ, and tried to determine which areas that individual would be weak in so they could try to strengthen it. For example, someone from the BJJ or wrestling world is probably more comfortable on the ground than on their feet so you make them work more drills on their feet to make them more comfortable. Someone from a boxing background isn’t looking for someone to kick them in the head so you work on improving their eye movement tracking to look at a larger box. Or someone from a kickboxing background probably has an office dweller’s weak back and glutes so you get them stronger in that area. Having spent time talking with Sean and Chris in Costa Rica about different rules surrounding kickboxing in different organizations (Chris transitioned from Muay Thai fighting into K1 fighting at one point) I found the concept of “kickboxer” far too general in Tony’s speech. A Dutch style kickboxer or American kickboxer may spend more time punching and kicking whereas a Muay Thai kickboxer looks more for clinches, knees, and elbows. Which is where you’ll see some issues with scoring or strategy when a kickboxer moves from one promotion to another. I asked if the UFC had started tracking single discipline athletes as broader than “kickboxer.” Like Dutch vs Thai. They currently don’t. This whole tracking thing is new. They gave me an awesome hard cover book that has everything they currently track however. And they are starting to track a lot of stuff thanks to the Performance Institute. Create a plan to increase the lifetime of the athlete. Have them become an expert in something once a year, instead of them trying to learn everything all at once. He suggested cluster sets as a way to train during this presentation. In a cluster set you would still set out to do the usual 5 reps 3 sets, but instead of jamming all 5 reps back to back, you’d spread it out with 1 rep, 15 second break, repeat until 5 are complete then take your typical rest period before proceeding again. The cluster set sounds similar to the “anti gylcolytic training” you hear about over at StrongFirst. Longer rest times so you can perform each rep cleaner / more efficiently to get the maximal gain from the exercise. This tied in to the first breathing exercises we did on day one. Having a warm up (or a set of breathing exercises) helps calm (or hype up depending on the person) the mind so the athlete is ready to go out and do what they need to do. If you’re too hyper or not hyper enough this can have a negative effect on your performance. We didn’t get a “do only this warm up” speech, but instead a “have something you do.” Yoga For BJJ (people from the BJJ cruise and the SFG cert who do BJJ know of this program) has an official warm up and cool down sequence now you may want to check out if you’re a BJJ enthusiast. Northwest Fighting Arts made this part of their Level 1 curriculum for Muay Thai. It’s literally a question on the verbal test. Why do we train at night? So we’re prepared to fight at night (I may have the question verbiage mixed up slightly.) You train to match the environment you’ll fight in. If you train in the morning all the time your body won’t be ready for the night, or vice versa. This was a “should I do this” or “shouldn’t I” type conversation. If this does this to my body is it worth it? And the answer to all questions is “it depends.” Awesome presentation. The final presentation for the day covered the metabolic efficiency of profiled fighters and how their body burned fat vs carbs. Through testing they were able to identify heart rates at which point the transition happened, which allowed them to train fighters in a specific heart rate zone to burn the specific fuel desired while also knowing how to fuel a fighter correctly based on the type of activity they were going to partake in. 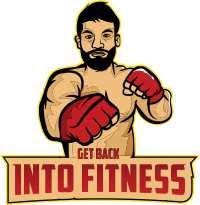 We covered 3 profiles – a fighter who burns fuels efficiently, a fighter who burns carbs too early, and a fighter who leaned more towards a Keto style diet who was burning almost exclusively fats and not carbs. I’m not a nutritionist and I’m not going to try and give you diet advice. The general takeaway here is that your body needs different fuels for different activities to perform at its most optimal level. 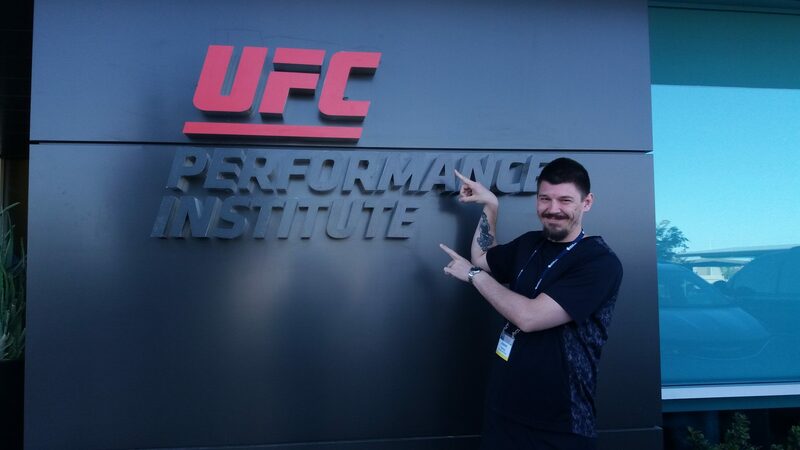 The people at the UFC Performance Institute are working with top level athletes who are bringing in millions of dollars in pay per view buys. It’s a very large industry. The difference in optimal performance for a fighter at this level is huge in terms of career longevity and lifetime payouts. For the average person who kicks a bag a few times a week or runs fun runs for fun we don’t need to be quite so dialed in. Overall the NSCA Combat Clinic of 2018 was amazing. I had an excellent time, and will most likely (unless it’s scheduled during the Muay Thai Cruise) be attending in 2019.